The hollow center, bottom drain hole, and lift-off top prevent build-up of water and dirt, keeping knives clean in a bacteria-resistant, hygienic product that's a cinch to maintain. 【10 Knives Storage】:Can store safely up to 10 pieces of any model present in the kitchen knife collection with blade length no more then 8.4". Kindly Tips: The knives are not included. 【Long Time Usage】: The flexible, grooved plastic keeps knives settled preserving the sharpness of the edge. Allow you to pull them out of the holder effortlessly. Easy to clean. Just hand wash.
【Space Saving】: Ergonomically designed, an optimal balance between functionality and size, makes the knife block a must-have object in any kitchen, whether it's home or professional kitchen, restaurants, coffee shops. 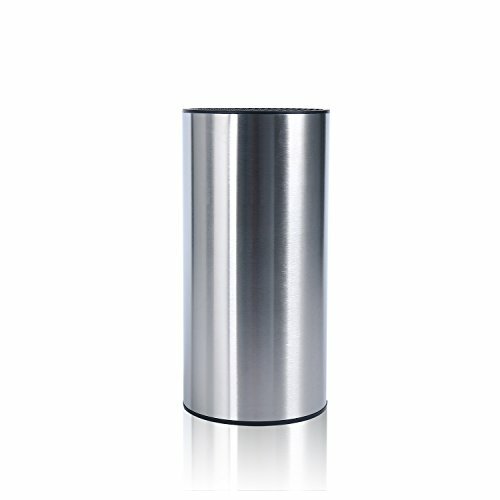 【Easy Cleaning】：Simply wipe down the stainless steel surface or rubberized lining to keep your knife block clean.